I was quite excited to have come across Darby Smart via Tried & Glue way, way back in early October. I was so excited that I actually bought 3 of them in a matter of a few days. Well, really excited and I somehow snagged two $10 off coupons, which brought two of the boxes down to $9 each, which is a pretty awesome price (plus there’s free shipping). PS if you sign up via this link, you’ll get $10 off your first purchase, too. If you’re not familiar with Darby Smart, here’s a quick rundown of one of the services they offer. I think they’ve expanded to adding a seller platform as well, but back in early October their main squeeze were these DIY kits you could purchase one at a time (not a subscription). Basically you pick a project you want to do, and they send you all the materials you need to make that project, which is really cool. I was extremely excited to have basically everything I need to complete a craft sent to me in a box. Another great part was that they sent you enough materials that you could potentially make another project by just replacing certain items that they sold individually on their site. So for instance, one of the boxes I bought was printed kitchen towels. They came with the two towels, ink, brushes, and stencils. So if I wanted to make more than just the two towels that were initially sent, I had the materials to make more. All I had to do was purchase the same towels (sold separately outside the box) on their site. Perfect. Further, they give you a link to instructions on how to do the craft if you need a little help. The stuff they offer is all really, really cute. 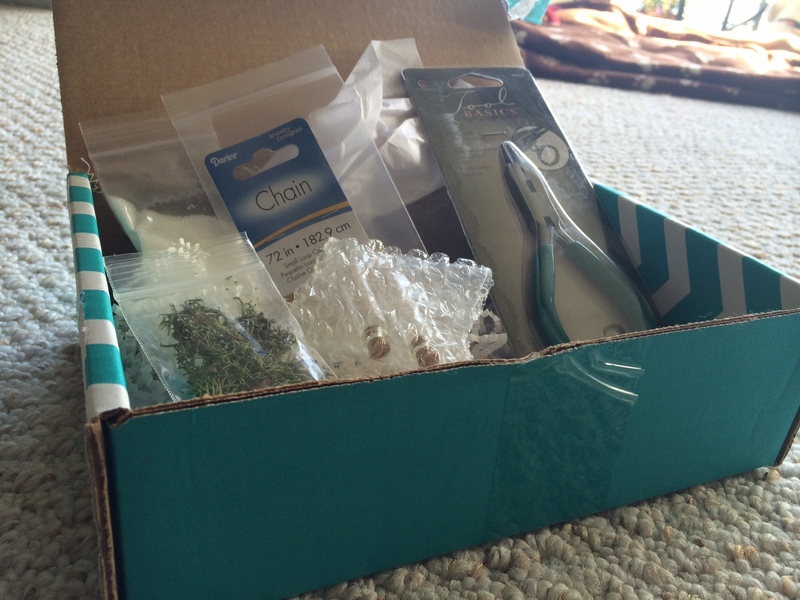 Overall, I had an OK experience with it and enjoyed doing the craft boxes I bought. I was a little disappointed that my experience was only OK though, and I’ll go into specifically why with each craft box I bought. I picked Stenciled Tea Towels, Pocket Terrarium Necklaces, and Agate Cuff bracelet. Here’s my experiences with each of the boxes I received. 1. Kitchen Towels – $17 (1 star out of 5) – Unfortunately, these did not work out for me. I’m pretty sure I followed all the directions properly and everything, but after I “set” the ink, it continued to smudge, even after I did it a second time where I set the ink for twice as long and let the towel sit for a few days. I was quite disappointed with this one because the towels came out super cute, but were basically useless. Unfortunately, I didn’t grab any pictures before I tossed the towels. 2. 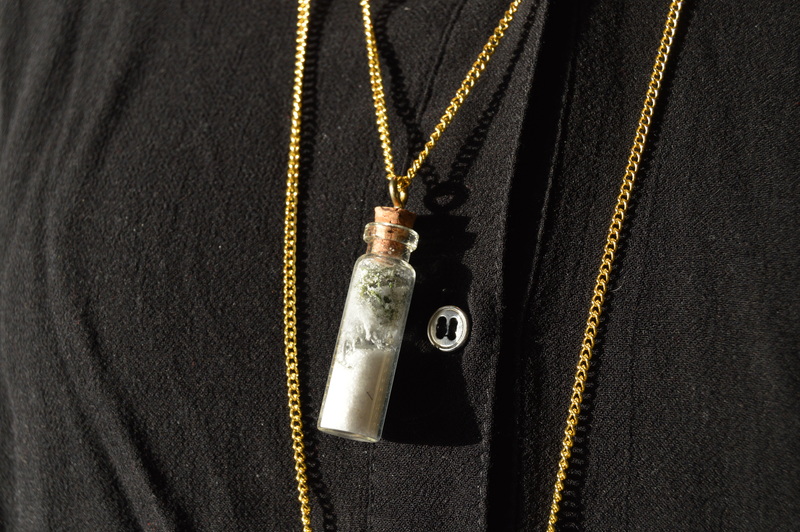 Terrarium Necklace – $19 (2.5 stars out of 5) – I thought this one was really really cool because we all know I love plants, and I do still think it’s cool. However, I have a few problems with this one. First, the gold necklace portion is super cheap looking. I get this is only a $19 kit and I’m not expecting a 14 carrot gold chain, but I feel a different chain could be used that’s not so “cheap looking” (and I really hate saying that). 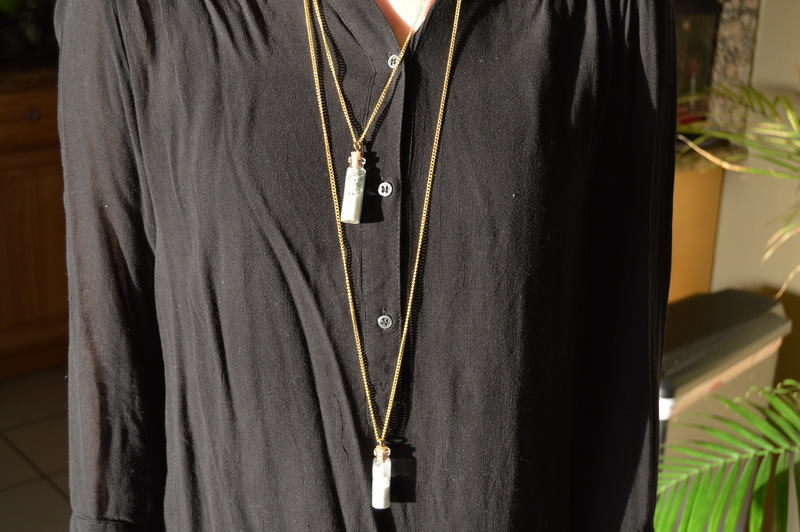 Second, when you wear this chain, the sand that’s in the little bottles inevitably gets knocked around. When that happens, for some reason the sand residue sticks on the sides of the inside of the bottle and makes it look super cloudy. You can barely see the grass in mine these days. I still wear this occasionally and it was fun to make, but the quality is lacking unfortunately. 3. 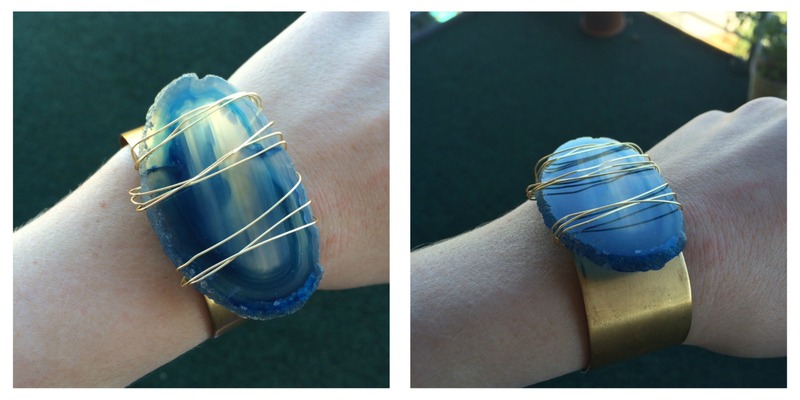 Agate Cuff – $19 (5 stars out of 5) – This one I would definitely recommend. What a cool bracelet! Easy to make and is now one of my favorite jewelry pieces. Like I mentioned before, with this one there is extra glue, extra gold wire, and they even gave me a second stone in a different color, so I actually just ordered another cuff and will make a second. Only issue I had with this one is that it states the glue only needs to set for 10 minutes. Try 10 hours. Overall, making the items was the most fun, but it would be really great if they were better quality and I could actually use them. Overall, I’d definitely say Darby Smart is worth trying because I had a lot of fun creating the items, regardless if they ended up working out or not, and will probably purchase again.